According to local media in Italy a tender boat from the Costa Mediterranea seems to have cut loose from its lines and is hanging from the ship’s port side. While the large Costa ship was calling at a port in Montenegro one of the ship’s own tender boats which can also be used as a lifeboat had some kind of malfunction. It seems a cable from one end of the boat had snapped. As a result the boat is hanging and being held up from only one side. 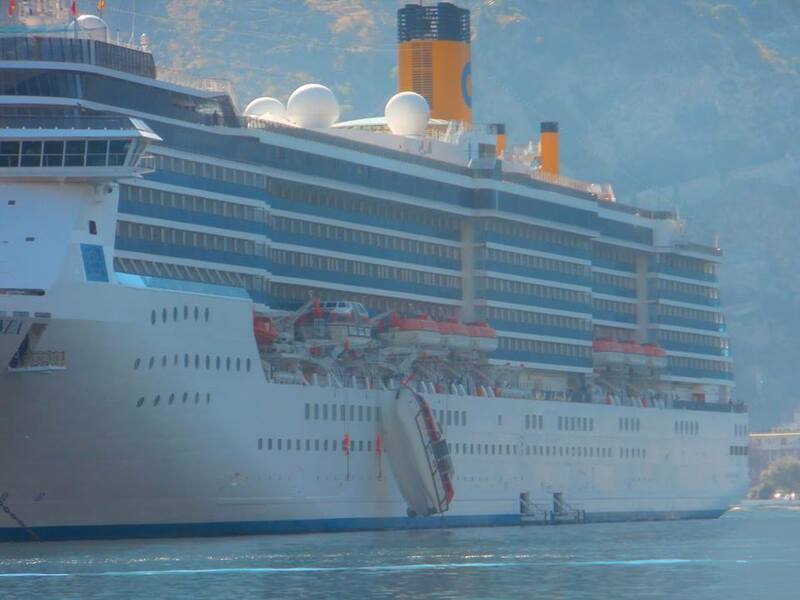 Costa Crociere confirms that the Costa Mediterranea experienced a technical problem with one of the ship’s lifeboats earlier today during operations for lowering tenders, while anchored in Kotor as per planned itinerary. The safety of the ship and of its passengers and crew has never been put at risk, as the tender was not carrying any passenger or crew member. All competent authorities have been informed, and the technical team is working to fix the problem and restore the situation. Thankfully nobody was onboard the tender boat at the time so no injuries have been reported. The boat was being lowered so it could be used to tender passengers to Fjord of Kotor in Montenegro. The Costa Mediterranea was about 200 metres from the coast. As a consequence of the technical problem, the planned itinerary has been modified. The ship that was supposed to depart today, will remain anchored in Kotor also tomorrow while the call in Argostoli (Greece), planned for tomorrow, has been cancelled. From Kotor the ship is expected to depart directly for Corfu, thereby confirming the port of call planned for Wednesday August 26th. The 85,700 gross ton vessel is on a 8-Day Mediterranean cruise which departed Trieste, italy on August 22nd. As a result Costa Cruises has made adjustments to the ship’s itinerary, The scheduled call to Argostoli, Greece has been cancelled so that the tender boat can be fixed. The ship will sail straight for Corfu from Montenegro on August 26th. Passengers have been constantly informed and have been given the opportunity to extend their excursions in Kotor until this evening. For tomorrow, shore excursions will continue with a 30% discount in prices. In addition to this, Costa Crociere will recognize an on board credit of 100 Euro for each passenger over 18 years of age. Moreover, guests who have already booked their excursion in Argostoli will be fully reimbursed. The ship is in total safety and fully operational and situation in board is calm. All passengers over 18 years old will receive a 100 Euro credit and any shore excursions booked for the cancelled call in Argostoli, Greece will be fully reimbursed. Cruise Hive will keep readers informed on any new developments.